Ice seals thought to be most affected by the disappearance of Arctic sea ice seem to be doing well, according to data presented at the recent Alaska Marine Science Symposium. The two species of ice seals that were declared “threatened” under the Endangered Species Act are, so far, doing well with less sea ice. 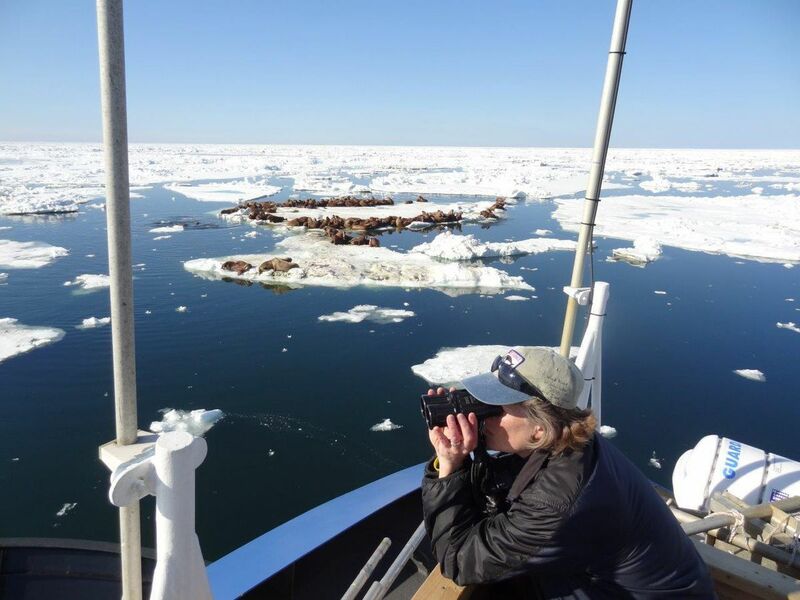 Quakenbush studies marine mammals and monitors their condition. She says that so far, the evidence indicates that ice seals are getting plenty of food. “We’re looking at stomachs and we’re seeing pretty similar diets to what they have done in the past. So we’re not seeing those big changes either. They’re still eating arctic cod; they’re still eating saffron cod,” said Quakenbush. First polar bears, then ringed and bearded seals were listed as threatened, even though they were not showing any population declines at the time. Bearded and ringed seals were listed because the Arctic was warming so fast that their ability to use sea ice to raise young would disappear by 2100, setting the stage for being endangered. Quakenbush is among the biologists watching for warning signs to show up in the seals. Along the North Slope coast, ice is forming a month later in the fall and disappearing earlier in the spring. Both ice seals in threatened status raise their young on the ice, but ringed seals have a unique behavior. They build snow caves above the ice to protect their pups from polar bears. It was thought that without thick ice for snow caves, ringed seal numbers would plummet, but now Quakenbush is not so sure. She points to populations that are now making do without snow caves in Russia’s Sea of Okhotsk. “Its far enough south that the ringed seals don’t build lairs. They pup on top of the ice, so they don’t have to have snow caves to produce pups. There are no polar bears there, so there may be some reasons why they are successful in doing that. We’re starting to see ringed seals haul out on land. We know how they behave when there’s lots of ice, and we’re just beginning to see what they are capable of without that. And I think they might more flexible in that behavior than we’ve given them credit for,” said Quakenbush. Quakenbush says that her data for the ice seals has only been analyzed up to 2016. This was before the spike in warm water two winters ago, which does seem to have made more major changes in the region, according to data presented at the Alaska Marine Science Symposium. "So we might see something upcoming here soon in the data that we have that might make us change our minds about how they are responding, but right now, up through 2016, we’re not seeing any major alarm bells,” said Quakenbush. Ice seals are not the only marine mammals adjusting to changes in the ice. Pacific walruses are doing so as well. They also used to raise their calves on sea ice, but recently started coming to Alaska’s shores to haul out in record numbers. New haulouts include Point Lay on the Chukchi coast, which historically didn’t have many walruses. Now there are thousands there most summers, and initial predictions were that that would be bad news for those animals. At first it was not pretty. Walruses spook easily, and stampeded over everytg in their path to get to the safety of the sea. They plow right over small calves, and the first few years there were lots of dead calves on the beach. The other prediction was that hunters would have more access to walruses, but apparently near-shore ice and stormy seas are a bigger problem for humans than walruses, and harvests have declined. This article originally appeared at KYUK.org and is republished here with permission.